1. What is the PSAT? Reading Test: 60 Minutes, 47 questions. Writing and Language Test: 35 minutes, 44 questions. Math No Calculator Section: 25 minutes, 17 questions. Please note: there is no Essay section on the PSAT. 2. Why should my student take the PSAT? The PSAT is a good way for students, especially homeschooled students, to practice test taking before taking the SAT. Although it can be a helpful way to practice before taking the SAT, achieving a good score can also mean more money for college. Students who earn the highest scores are eligible to earn scholarships. The scores received can also help students identify their strengths to create a study plan for the SAT. College Board has a free SAT practice site that is based on a student’s PSAT scores. 3. When do you take the PSAT? You are only able to take the PSAT once a year and often times students will take the test in both the 10th and the 11th grade. The tests are given in October but for exact dates check out CollegeBoard. There is also a PSAT 8/9 that is designed for eighth and ninth graders. Only the scores taken in 11th grade count toward qualifying for the National Merit Scholarship though. 4. Is there a way my student can study for the PSAT? 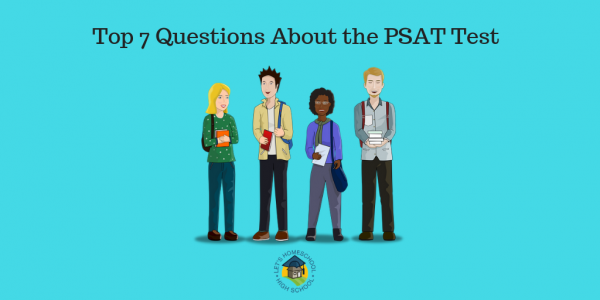 The PSAT bases its questions on knowledge you should have from previous high school classes and general knowledge you have learned. This test will show how well you can work on the spot with the information they give you and that you already know. You will not need to remember specific facts from history, science, or literature. 5. Is it possible to take a practice test for the PSAT test? CollegeBoard is a great place to find practice tests and helpful information to ensure your students can be as successful as possible. Knowing the format with these practice tests goes a long way in making a student confident for the test. There are also some free online quizzes that might be beneficial practice. 6. How long does it take to take the PSAT? It takes 2 hours and 45 minutes to take the PSAT. It’s a good idea to bring a snack and drink. You will get a short break at the end of each hour of testing and you can eat or drink then. 7. What is the highest score possible on the PSAT? Currently the PSAT is scored between 320 and 1520 points. Your student will get two scaled scores between 160 and 760. One will be for Math and one for Reading and Writing combined. (Evidence-Based Reading and Writing, or EBRW) There is also a score that shows how well your student performed on each of the three sections with a test score between 8 and 38. Joy Capps is a homeschool bookworm residing in the mountains of western North Carolina. The only one who loves books more is her 16-year-old daughter. They both enjoy perusing old bookstores for treasures and sniffing books. Her son who is 18 has special needs, is the social butterfly of the family and has never met a stranger. Although she is originally from South Dakota she now calls North Carolina her home and she and her family love exploring the great outdoors. Her family has been homeschooling since 2005.